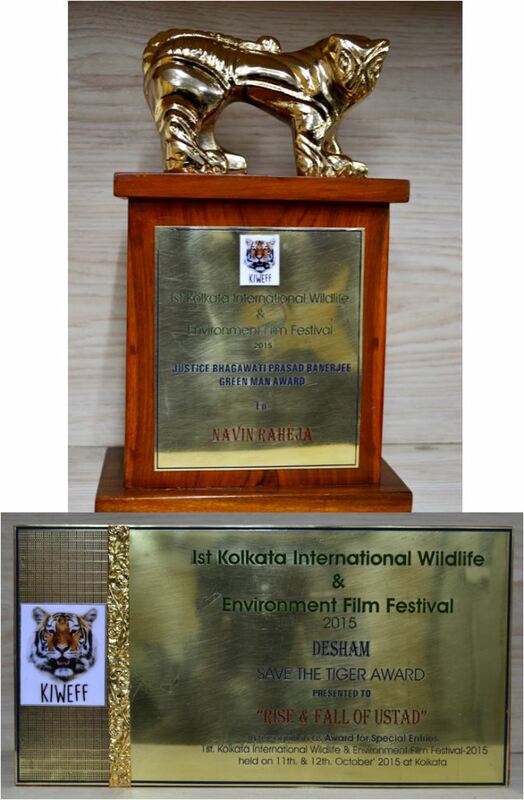 New Delhi, Delhi, India: Kolkata International Wildlife & Environment Film Festival announced its line-up of awards for the different categories of films on 12th October 2015. In the film festival, the producer of ‘The Rise and Fall of Ustad’ Mr. Navin M. Raheja was given an accolade as the Justice BP Banarjee Green Man Award. The award was given by festival Chairman Sri Soumitra Chattopadhay, a noted actor. Mr. Navin M Raheja, the CMD of Raheja Developers is known for his philanthropies for the tiger reserves and he is known as a successful wildlife enthusiast. The film is about a Photogenic Ranthambore tiger ‘Ustad’ who has 4 deaths to his credit. Apart from his passion of wildlife, Mr. Raheja is known for his philanthropies for poor and less fortunate. He successfully steered 2800 families and rehabilitated them to better living. Raheja group has changed the life of 20,000 people by providing them better sanitation facilities. The award function was attended by Honourable Governor of West Bengal Mr. Keshari Nath Tripathi.